Tanzania government bans any food commodity exportation after Kenyan businessmen caught at the Border smuggling Maize. - Bana Kenya News, Real African Network Tubanane. Home World Tanzania government bans any food commodity exportation after Kenyan businessmen caught at the Border smuggling Maize. Tanzania government bans any food commodity exportation after Kenyan businessmen caught at the Border smuggling Maize. The Tanzanian government has banned food export to any country. The ban comes after Kenyan traders were found at the border smuggling maize to Kenya. Kamau Ngige and Mary Macharia were found to carry 1000 Kgs of Maize to Kenya. The government has urged all its citizens not to sell any food commodity to anyone outside the country. 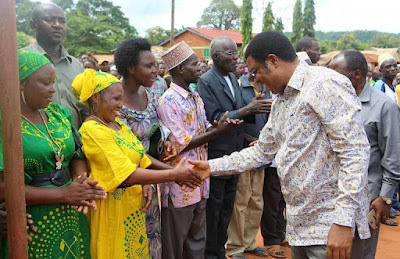 The Tanzanian Prime Minister Kassim Majaliwa has said that the people of Tanzania will face food shortage if the allow people smuggle foods to their drought countries. The Prime Minister urged the people of Tanzania to look for other ways of getting money and cultivate and their food to make the country safe from food shortage. "Do not be deceived by conmen and rogue businessmen who smuggle food to their country with little cash. Their countries are in a food crisis. When we sell our food then we will be in food crisis too. Anyone found to sell food to another country will face a 6-month jail term" Said Kassim Majaliwa Majaliwa the Tanzania Prime Minister.